Bitsize Wars is a tiny, cute and speedy multiplayer RTS. It has the familiar building, massing and charging phases that you'd hope for from an Age of Empires or a Total Annihilation, but crammed into a few minutes. Your little dudes chop wood as fast as their little forms arms allow and carry it back to base at admirable speed. Little huts spew out warriors and before you know it, armies are clashing in a storm of damage numbers and the battle is won. It's Total War: Zelda, basically. at a hundred miles an hour. 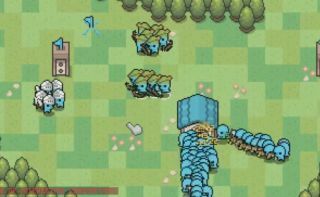 Bitesize Wars has successfully barged through Steam's Greenlight process and will soon be sold on Steam and Desura after a period on Steam Early Access. It'll cost $3.50 in Early Access and $5 for the final build. There will be a very user-friendly level editor and a single player campaign in the final release too.